Our main modem (Optical Network Unit) is in the living room which comes from the ISP. Then I set up WRT54G, making it the 2nd modem, which I set up with an IP of 1.2.3.4. If anyone wants to connect to a wired connection, it will now be connected to the 2nd modem, the WRT54G. I connected another unused Optical Network Unit; let's call it 3rd WiFi modem to my 2nd modem. It has an IP of 192.168.254.254 which the unit comes from another Internet Service Provider. Here's the problem: The IP of my desktop which is connected directly to the 2nd modem which has an IP of 1.2.3.100 after connecting the 3rd WiFi modem to my 2nd modem the IP of my desktop change to 192.168.254.something and showing it's connected to 3rd modem when in fact it's directly connected to my 2nd modem. 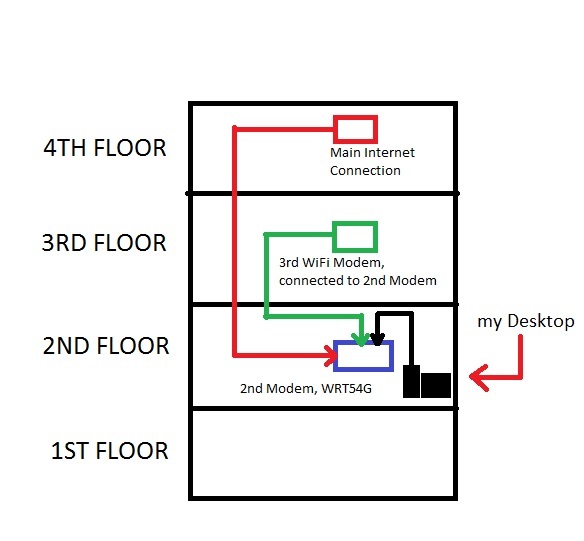 If I understand your question, it sounds to me like the WRT54G is acting as a switch and allowing the 3rd router to assign the IP to your desktop. This is a very unideal setup. I'd recommend using Access points and switches to expand your network and allow only one router which will need to be the ISP's router. If you're set on using the listed hardware, turn off the DHCP servers on all except the ISP's router and put them all on the same subnet such as 192.168.1. * etc. Then on each router after the ISP's (again with DHCP server disabled on secondary routers) give them a static IP outside of the DHCP range on main router. This should allow them to basically act as switches for you. Not the answer you're looking for? Browse other questions tagged networking router lan modem wan or ask your own question. How to connect cat. 5e cables that are put in the wall? Access storage connected to router from Modem ?